NBC-TV aired Episode 3 of its new hit series Blindspot last night. For me, they hit this one out of the park for a home run. Maybe it wasn’t a grand slam home run or even a prodigious, in terms of distance or in this case, ratings, home run – but it had enough to leave the park, thereby hooking this viewer. This is third Episode and it was called Eight Slim Grins. The second episode was called A Stray Howl. For what it is worth, those episode titles are anagrams. A Stray Howl becomes Taylor Shaw. Eight Slim Grins becomes The Missing Girl. By the way, I’m not at all into anagrams, so take it as gospel that I didn’t figure those out myself. However, I am old enough to know what the word ‘derivative’ means. At its simplest – derivative can mean ‘something that has developed from something else’. Of course, in that sense, most of television is derivative. But derivative is also a relative word. By that I mean that a person who has been watching TV and movies for say 30 years, may have a far greater amount of knowledge about film and tv shows than someone who has, say, a quarter of that amount of experience. 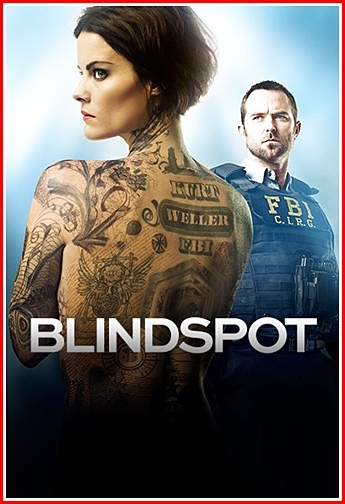 Now Blindspot is a mystery, a police procedural, and it has a certainly intriguing character who has no idea who she is, or where she’s from, or even how she ended up where she is – that is in the hands of the FBI. But having memory loss may not be new, also having inexplicable talents and skills is not a new television concept either. Within this very show, in the first three episodes, FBI Agent Kurt Weller has told this Jane Doe to wait outside, wait in the hall, and wait in the car. I’m wondering if that can be called self-derivative. Weller: I’m going in and you’re waiting in the car…. You know the Bourne films – first there was Treadstone, then came Blackbriar, and by the 4th Bourne film, called The Bourne Legacy, the black ops program was now being called Operation Outcome. Which I offer up as examples of derivative. 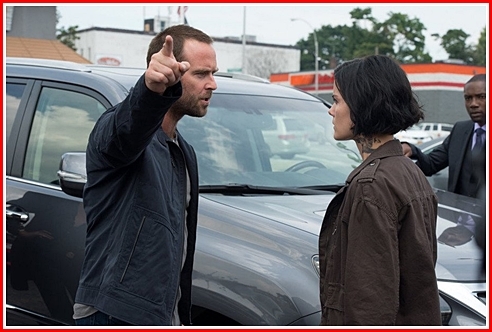 Now in Blindspot, by the end of the 3rd episode, we hear of another secret operation. This time it was called Daylight. Now didn’t we see and hear of a clandestine secret group within the CIA, as in a CIA within the CIA. in the film 3 Days of the Condor?